If you like having delicious espresso any time at home instead of waiting for your next trip to the nearest coffee place, you can get an espresso machine for your home without having to pay through your nose for it. The best home espresso machine under $200 will be enough for most people’s needs, as long as you’re not fussy about bells and whistles or gourmet style results. First, you should know about the types of espresso machines. A semi-automatic is one where you control the flow of water for each brew by turning the pump on or off. However, maintaining the right pressure and constant even heating of the boiler is taken care of by the machine. A fully automatic even regulates the amount of water that passes through the espresso grounds. A super-automatic machine has bells and whistles and usually comes with a built-in grinder. Caffe Crema became popular because of this type of machine. It dilutes an espresso to a regular cup of coffee but with all the other properties of an espresso retained. The best espresso maker under 200 dollars will either be a semi-automatic or a fully automatic. For those with bigger budgets, we have best of lists of espresso machines under $300 and under $500. Read on to see our picks for the best espresso machines under $200. Who wouldn’t like a one-touch feature to make a single or double shot espresso? Well, you’re in luck as that’s exactly what you get with the Mr. Coffee Café Barista Espresso Maker. But that’s not all. This machine also comes with options to choose cappuccino or latte instead, with an automatic milk frother that dispenses milk into your cup with a touch of a button. The frother is equipped with a self-cleaning feature and all you have to do is press a button to activate it. There is the option to control the milk dispensing manually if you don’t want to use the automatic feature. The water tank at the back is quite big, about 55 ounces. This means you don’t have to keep worrying about refilling the reservoir. Its built-in milk tank is removable so you can store the unused milk in the fridge. The cup tray is adjustable and this allows you to choose your shot size – single, double or customized. There is a drip catcher too, to keep the brewing area clean and spotless. The 15 bar pressure ensures a potent drink and this makes the crema rich and full. And with all the removable parts, except the water reservoir, being dishwasher-safe, you can keep the espresso maker clean and odor-free. You get a single shot filter, a double shot filter, a tamper and a measuring scoop. All these features are just designed to make espresso making easy. If there is negative, it would be that the cord is only 2 ft long, which is a trifle short. Also, the water reservoir should be made to be dishwasher safe instead of having to be cleaned by hand. Otherwise, many customers love it and it could very well be the best espresso machine under $200 taking everything into consideration. Here you have the Breville ESP8XL Cafe Roma that’s amazingly priced for a really well made espresso machine. The reason it’s the best inexpensive espresso machine you can buy is because it is no longer being manufactured. Replacement parts that are cross-compatible with this model are easily available on Amazon and through the manufacturer’s site. You get a machine with a 15 bar pump. This means you have the right amount of pressure to make great espresso first time and each time after. You can add your own custom grind that gives just the richness you want with this double serve brewing system. It comes with two double wall filters for one and two shot sizes. You get your coffee and then the crema in a two-step process, and to get the best flavor, your grind mustn’t be too fine or coarse as that affects how the water flows over it. You should also tamp down hard so as to not leave a watery puck. You now can control the flavor to give just the richness and body you desire for the perfect flavor each time you brew. The drip tray removes for easy cleaning and a warming plate keeps your cup warm when you put it down. You can make either 1 cup or 2 cups at a time with the two filters, which hold 1 oz or 2 oz of ground coffee. So with this machine you can make espresso for two or give yourself a double jolt of coffee if you need it to get through a particularly tough day. If you don’t want to prepare grind of your own or measure out the right amount each time, you can use most brands of ESE espresso pods. These pre-measured portions of coffee fit into the smaller filter, although some users say that this machine doesn’t work as well with them as they do with your own measured out grounds. You also get with the Cafe Roma a steaming wand along with a stainless steel cup set and frothing jug that facilitates the whipping of the milk or making the latte topping for coffees other than espressos. You can switch between coffees quickly and the machine is easy to clean if you remember to use the right type of grind, as too fine will clog the filter. Breville’s customer service is great. They are responsive and solve your problems right away, so we rate this as the best pump espresso machine under $200. The Inissia can make both regular espresso and lungo and is the best espresso machine on a budget. Lungo takes the same amount of ground coffee as a shot of espresso, but is brewed over a longer time and uses more water, so it’s a taller beverage. Many find lungo to be weaker than espresso in terms of caffeine but more bitter in flavor. The Nespresso Inissia is extremely energy efficient and fast; it heats quickly and you do not have to wait for the machine to warm up before you make your coffee selection. It will also turn itself off after nine minutes of inactivity. There’s a removable 24 ounce water tank for easy cleaning and filling, and a folding cup tray that allows you to move easily from regular cups to tall. Nespresso offers a cleaning sachet and has detailed cleaning instructions in their manual, available on their website. Nespresso machines use only Nespresso pods so you are limited to the the brand’s brews, but in recent years, the range offered is quite vast. Also, this means there’s no fuss with filling a porta-filter and tamping. Additionally, this machine does not come with a frother, so if you prefer a latte or a cappuccino, you will need another tool to finish your coffee. The Inissia comes with 19 bars of pressure for your brewing enjoyment. If you like plenty of crema, you will love this machine. Finally, the extremely compact and lightweight Nespresso machines now belong to Delonghi but you can still get the old models if you want. This model is also among our top picks for pod espresso makers. The EC330 is a new bright spot on any counter thanks to the reflective stainless steel finish. The removable drip tray wraps all the way around the front of the machine and is easy to take off and clean. The 1 litre water tank is also removable for easy descaling. You can prepare your espresso from ground coffee or ESE pods and the machine is self-priming and ready to go for your next brewing cycle. You have to manually stop it once your cup is filled but the resulting brew will be great. The instructions may not be clear first time, so we recommend that you look for a video of how to use it. This machine also features a steam wand for lattes and cappuccinos. The milk frothing wand is fixed on the right side of the espresso maker as you approach the machine and is high enough to allow for plenty of clearance for your pitcher. This tool offers 15 bars of pressure for great crema. The EC330 heats quickly with dual thermostats and powers down after a period of inactivity for safety’s sake. You can adjust this shutoff time per the manual. This Delonghi EC330 espresso maker will brew double shots if you prefer but only has space for one large cup, so you can’t brew for multiple drinkers at once. Additionally, there are few accessories with this machine. You’ll need to purchase a milk frothing pitcher and a tamper to pack your espresso grounds, as the included tamper is not good. However, you’ll get three separate filters for ESE pods, single shot, and double shot. This appliance will let you know when it’s time to descale your espresso maker. DeLonghi descaling cleaner is recommended and the cleaning process is easy to follow in the manual. Be aware that descaling takes three pitchers of water; one with descaling liquid and two containers of plain water. You will need to be there to turn the steam dial off and on repeatedly until all three pitchers of water have been cycled through your espresso maker. The Hamilton Beach 40972 is a flexible espresso making tool that can work with plain ground coffee or ESE pods. As with any espresso maker, you will need to tamp the grounds for best flavor. Additionally, be sure you use an espresso grind when preparing a beverage in this machine. Any time you’re dealing with hot water under pressure, there are safety risks to consider. For those who struggle with focus before that first precious cup, getting everything put together can take a bit of time. Luckily, this machine heats very quickly and features a predictable set of steps to use when putting coffee, water and heat all together. Once water is added to the removable reservoir, and coffee or a pod to the filter, and you’ve tamped the grounds as necessary, the filter holder has a locking mechanism that is easy to engage. The drip tray can be removed for easy cleanup, and the steam wand swivels for easy access to your steamed or frothed milk. Finally, the 40792 offers fifteen bars of pressure for rich crema. This machine is a bit larger than many inexpensive espresso makers like this, thanks to the large water reservoir and double demitasse cup set up. If you have more than one espresso or cappuccino drinker in your house, you can enjoy brewing two cups at once. Or you can use just one standard size coffee cup to have a double shot yourself. 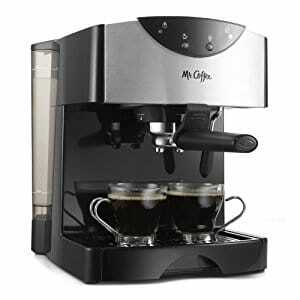 The Mr. Coffee ECMP50 brews single or double shots of espresso in less than a minute. Fans of cappuccino will appreciate the easy to use milk frother as well. The brewing process with this tool is quite simple. Fill the 40 oz. removable water reservoir with filtered water, then fill and tamp your espresso filter. Lock the filter in place, heat your water and press brew for a single shot or double shot. You can fill two espresso cups at the same time or one standard cup. For cappuccinos and lattes, add cold milk to your frothing pitcher, place the steaming nozzle below the milk line and froth away to almost double the volume of milk. Pour the right amount into your coffee cup before placing it on the tray for the espresso brew. The fifteen bars of pressure available on this machine will give you great crema. It should be noted that this tool will not work with pods; you must use ground coffee for your espresso. The frothing arm swivels for easy access and can be rotated under the filter basket when not in use. You’ll find this machine heats up very quickly, so it’s important to have everything ready to go before you start your brewing process. The ECMP50 does come with a plastic tamper but doesn’t include a frothing pitcher. ← What is the Best Slow Cooker to Buy?